Region: This Caterpillar is found throughout the United States and southern Canada. Life cycle: This insect produces one to four generations each year. The pupae overwinters in its cocoon that is attached the tree bark or sometimes orchard and garden debris. The eggs are laid in clusters of 200 to 500, and hatch in ten days. The larvae from each egg mass live in colonies. When fully grown the caterpillars leave their tent to search for a place to cocoon. This insect is often bothersome in cycles. Several years of numerous populations, followed by near absence for a few years. 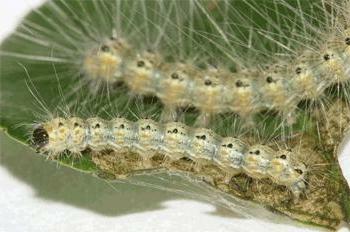 Physical Description: This 1-inch long caterpillar is pale green or yellow with long silky hairs appearing in clumps. The adult moth is white with brown marks and a wingspan of about 2 inches. It lays its hairy eggs on the underside of leaves in large masses of200 to 500. The cocoons are gray. Similar insects include the Eastern Tent Caterpillar, Saltmarsh Caterpillar, and Yellow Woollybear. 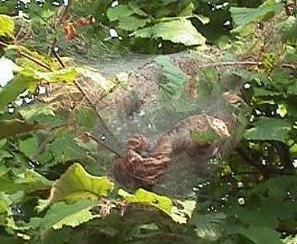 Feeding characteristics: This pest attacks apple, cherry, peach, pecan and walnut trees by making silk nests on the ends of their branches and feeding on the leaves. Controls: You can keep the numbers low by cutting off and burning their nest when they first appear. If the damage is intolerable, spray with Bacillus thuringiensis or dust with sabadilla.